Constructed from solid steel, this easy to use tube notcher is built to perform accurate notches, time after time. Designed to notch tubing from 3/4 In to 3 In tubing, which means you can build anything from a Go Cart to a 3 In exhaust on your hotrod. Use any 1/2 In hand drill to power the Eastwood Professional Tubing Notcher. Accepts all standard hole saws. Adjustable up to 50 degrees with the loosening of one bolt. Adjust to your desired angle with one hand and lock down the bearing block with your other. Easier adjustment than other designs on the market. 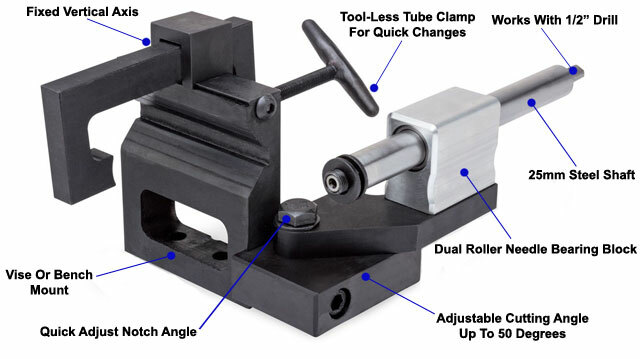 Vise or bench top mounting. The Eastwood Professional Tubing Notcher is designed with the professional fabricator in mind to create precision “fishmouth” notches within a wide range of angles from 90° to 150° in tubing up to 3" diameter using a hand drill with a 1/2" or larger chuck. Equipped with roller bearings and a 25 mm steel shaft, this notcher should provide years of reliable service.